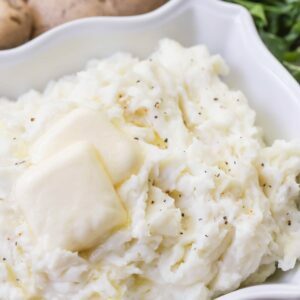 My FAVORITE mashed potatoes recipe! These Buttery smooth mashed potatoes are our Go-To potato side dish recipe for every dinner and holiday get together. Mashed potatoes are an iconic food in my life. I have so many great memories of sitting around the table with my family eating and enjoying mashed potatoes together. Today’s recipe is our classic homemade mashed potatoes, but we also love our Cheesy Mashed Potato Casserole, and Slow Cooker Mashed Potatoes. 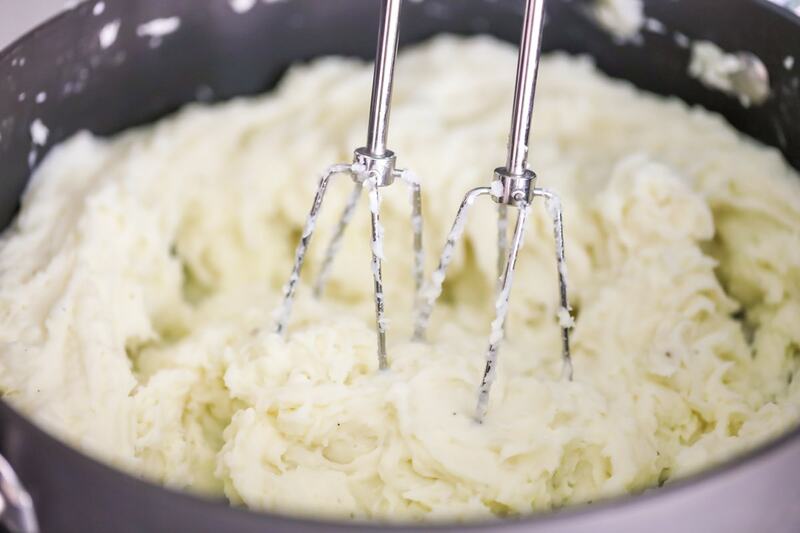 All you need to make the best mashed potatoes are a good masher, lots of butter/salt/pepper, and hot cooked potatoes. Then you already halfway there. Mashed potatoes are pretty forgiving. Lumps or no lumps? I like no lumps – the creamier and fluffier the better. Kids and adults alike will go crazy over these easy and yummy homemade mashed potatoes. This is a question we get asked all the time! There are definitely a few varieties of potatoes that work best for mashed potatoes. You want to use the ones with higher starches, like Russet or Yukon Golds. They make for the fluffiest and smoothest mashed potatoes and absorb flavoring more easily than other varieties. Red or white potato varieties are more waxy and usually take a little more work and mashing to be more creamy. Butter your slow cooker and add a few tablespoons whipping cream to it. Keep slow cooker on LOW and transfer your mashed potatoes to it – keep in there for up to 4 hours, stirring before serving. 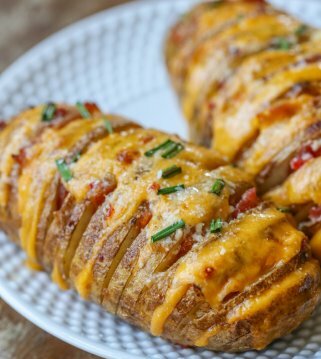 Potatoes, in general, are our favorite!! And making these mashed potatoes is easier then you think. You’re going to need 5 pounds of potatoes for this recipe which feeds about 10 people! Make sure to wash, peel, and cut your potatoes into chunks before starting. Place the cut potatoes into a large pot. Add enough water to the pot to cover the potatoes. Bring the water to a boil, then let the water simmer until the potatoes are fork tender (about 20-25 minutes). Stick them with a fork to see if they are ready. Drain the water form the pot. Add the cream cheese, butter, cream, and salt. 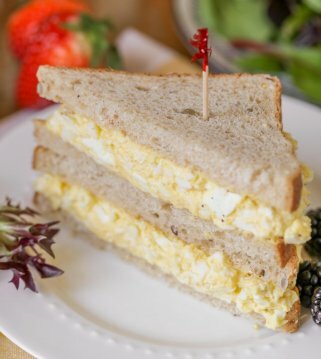 If the cream cheese scares you, I promise you cannot even taste the cream cheese in this recipe. It just adds to the flavor and creaminess. Use a hand mixer to blend all of the ingredients together. Keep mixing until its as smooth as you want it. Add any more salt and pepper and you’ll easy fall in love with this creamy mashed potatoes recipe. Add a few more butter slices on top before serving because a little more butter is always a good idea. Enjoy every last bite of these classic fluffy mashed potatoes. How many potatoes per person for mashed potatoes? You should plan on about 1/2 pound for each guest, so a 5 pound bag should feed 10 people. How long to boil potatoes for mashed? Once your potatoes have come to a boil, reduce to low and simmer for 20-25 minutes. As long as your potatoes have plenty of butter and cream, they’re great for freezing. We recommend placing them in a freezer-safe Ziploc bag and laying them flat (it makes it easier to store and to reheat). Stored properly in the fridge, mashed potatoes can be stored in the fridge for 3 to 5 days. 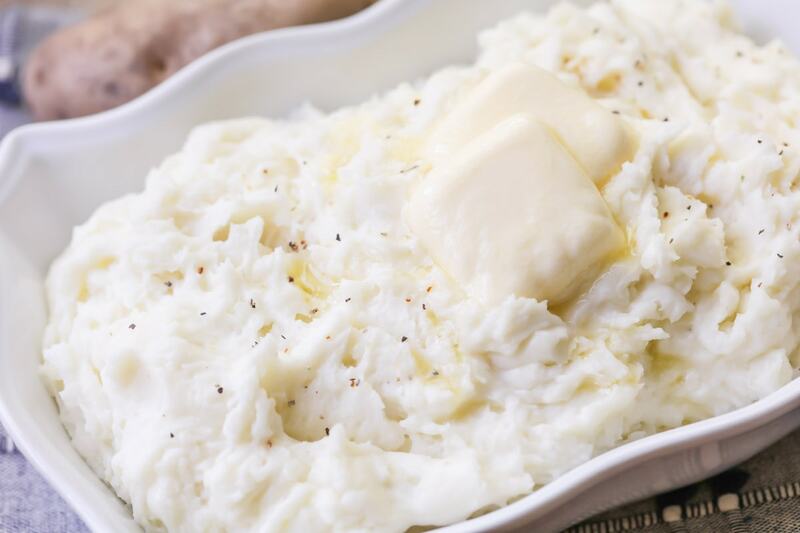 MICROWAVE – The easiest and fastest way to reheat mashed potatoes is to place them in a covered dish and heat them in the microwave at half-power for 4-5 minutes, stirring occasionally. 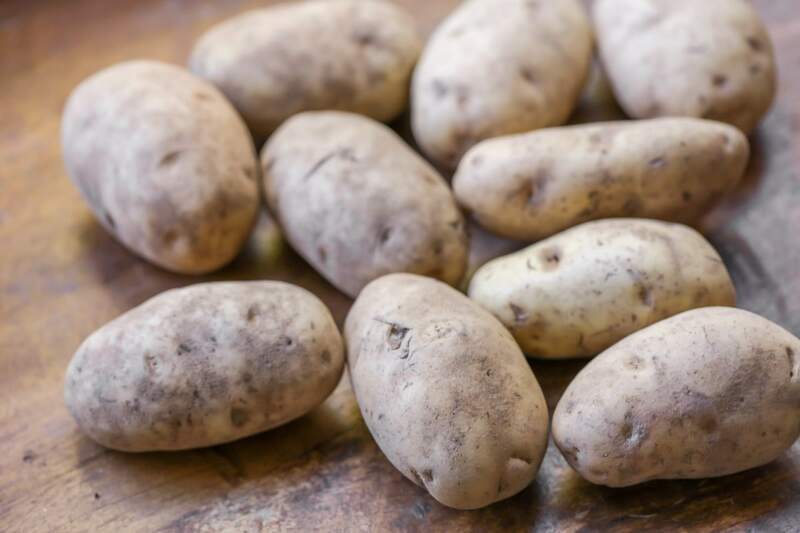 STOVETOP – Let potatoes thaw overnight in the fridge and place in a large pot on low to medium heat. Stir occasionally until heated through. SLOW COOKER – Thaw potatoes overnight in the fridge and heat on low for 2-4 hours. 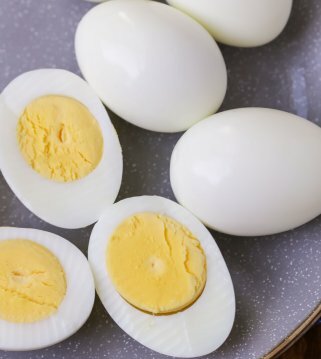 For all of these, add butter or dairy (sour cream or cream cheese) and additional seasonings, if needed when done. As you can see, mashed potatoes are just one of those recipes that everyone wants to master. 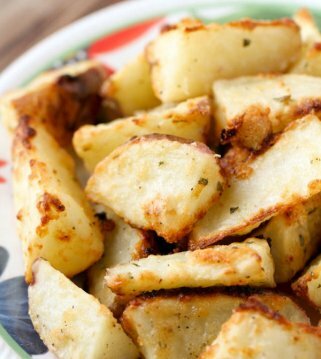 There are usually loads of questions about them, and they are everyone’s favorite side dish!! We’ve enjoyed this recipe since I was little and hope you enjoy them as much as we do! Place cut potatoes into a large pot. Add water to pot, covering potatoes. Let water come to a boil, then lower heat and simmer until potatoes are tender (about 20-25 minutes). Drain water, add cream cheese, butter, cream, and salt. Using a hand mixer, mix all ingredients together until you reach your desired consistency. Season with any more salt and pepper. Mashed potatoes are the best, and I don’t make them nearly often enough. I’ve never tried freezing them before, thanks for the tip!! Those potatoes look delicious! I could make a meal on them! You totally can!! They are my favorite!! Thanks so much! YUM!! 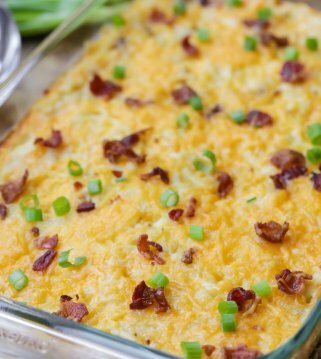 These make the perfect side dish for holiday dinners! 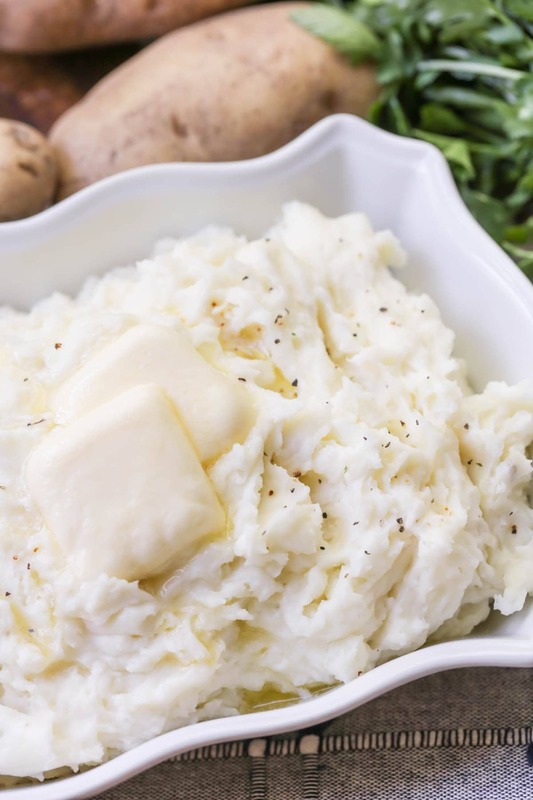 So much yes to these mashed potatoes and simple tips! Anytime I can make mashed potatoes, I’m doing it!! Can’t wait to try this recipe. Looks amazing. Would a kitchen aid mixer work? Every time ive tried mashed POTATOES they turn out lIke glue. I cant figure out what im doing wrong! Im hopeful in trying your recipe thoUgh! Oh, man..I hope these work out for you!! I’ve honestly never made them in my kitchen aid, but I don’t see why not? Good luck! I’d love to know what you think! I used this recipe for Thanksgiving today. It was delicious. Thank You! Thank you so much for trying these!! They are my favorite! !